This lady could have used our help – a crime of fashion | Do We Love It? The description: I can forgive a lot of fashion crimes in the name of college football fandom. (Roll Tide and congrats boys – you made us proud!!) But wearing three inch-heeled prom shoes at 11 a.m. on your way to spend the day in the French Quarter is not one of them. And as you can barely see at the top of the photo, she was wearing them with denim capri pants. All of the above was tacky, yet not unexpected. But for the life of me I could not figure out why she would be wearing those shoes to walk around on what have to literally be the worst streets in America. In fact, after I showed this pic to the husband of the couple I was there with, he turned to his wife and said “I would kill you if you ever wore shoes like that to walk around New Orleans.” Because he knew, as well as I did, that within about thirty minutes of getting off that trolley that woman would seriously be regretting her footwear decision and her husband would be the one who would pay the price. 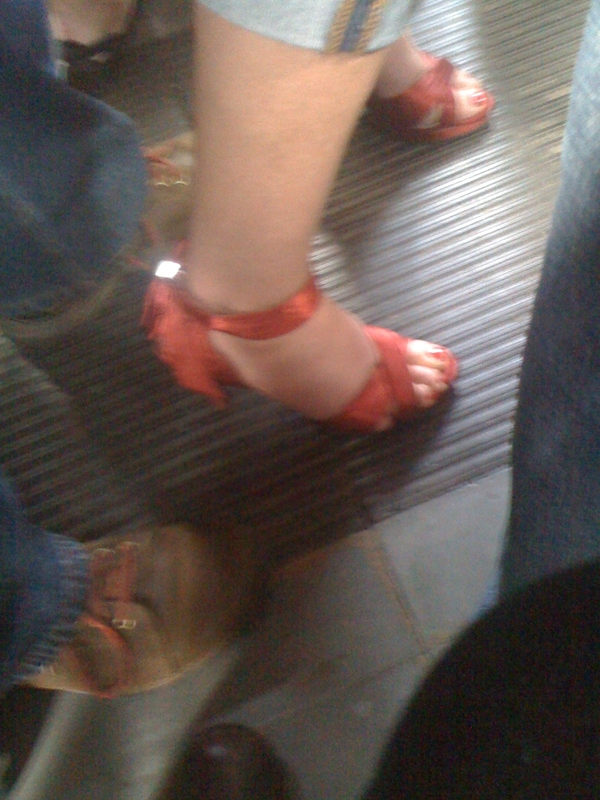 So remember kids, friends don’t let friends wear prom shoes to walk the French Quarter. This entry was posted on Monday, January 16th, 2012 at 2:52 pm	and posted in Uncategorized. You can follow any responses to this entry through the RSS 2.0 feed. « Gap legging jeans in russian red – do we love them?